Every meal seems to be an adventure in our house and our Christmas dinner was no exception. I was determined to have Goose this year; and so we did. Right after Thanksgiving we started our "hunt" for the perfect frozen (because let's face it the only bird you can find fresh here in Phoenix is a chicken) goose. Believe it or not we actually found several stores that sold the frozen bird. Prices and sizes varied among them. We ended up purchasing ours from our favorite butcher shop Hobe Meats. There was only going to be 4 of us this year for dinner and they were able to offer us the smallest bird; a 10 pounder. "Hunting" the bird turned out to be the easy part. It was less than a week before Christmas and we still needed to find a recipe. There were several recipes available online but having never cooked goose before we wanted to make sure we got a good one. Since Lidia Bastianich had never let us down before we decided to go with her recipe for Roast Goose with Mlinzi. 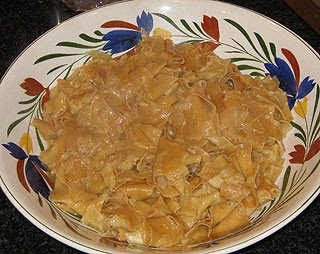 Mlinzi is basically fresh pasta that has been rolled into thin sheets and baked in the oven until crisp and then broken into pieces before being boiled like ordinary pasta. This method brings a nutty flavor to the pasta which compliments the dark meat of the goose. It also makes the pasta more porous which allows it to soak in all of the pan juices from the cooked bird. Finally the goose went into the oven and my mom was able to relax. That is until she heard all the noise coming from the kitchen. "I think the goose is trying to get out" "No mom I think that would be the grease splattering" We had read in advance that there would be a lot of grease but I don't think it was as bad as some people made it out to be. About 3 hours and 170 degrees later and the goose was ready. It was time to carve the bird. This proved to be the real challenge. The joints were extremely difficult to find. So instead of breaking off the wing/leg and serving them whole we had to cut the meat off the bones. The breast was only slightly easier to carve. After what seemed like a long battle; that I'm still not sure who won; my husband finally got the carved bird to the table. The mlinzi were mixed with the thickened pan juices and used as a bed for the goose meat. Although we had plenty, I was amazed at how little meat a 10lb goose yields. The meat was delicious and went extremely well with the nuttiness of the mlinzi, (Lidia sure knows her stuff). All in all we were pleased with the dinner but my husband and I both agree that we will reserve goose for a very special occasion. The amount of work and money (did I tell you it was $51) we put into it didn't compare to the amount of meat or stress we got from it. I love your story of Christmas dinner. Very cute! I've never cooked a goose before and I am not sure that I am up to it! It does look delicious. Happy New Year!! Wow! Your cooked goose is impressive. I really liked the pasta dish-very interesting. I love the idea of having a cooked goose for Christmas...and the literal wild goose chase you went on! Mlinzi sounds really interesting. Lidia has never let me down, so I'm sure it must have been a fantastic meal! 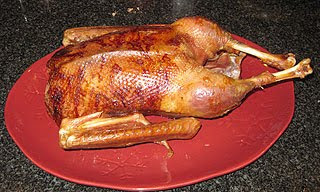 I don't exactly know why, but the picture of your Christmas goose makes me think of the expression, "My goose is cooked". Definitely not a very positive thought, I'm afraid. I give you "A" for effort nevertheless.